The following is a list of some words that would give me pause. Not because they are bad or wrong words but because these words are often misused or overused or they just don’t mesh with scientifically based positive reinforcement. 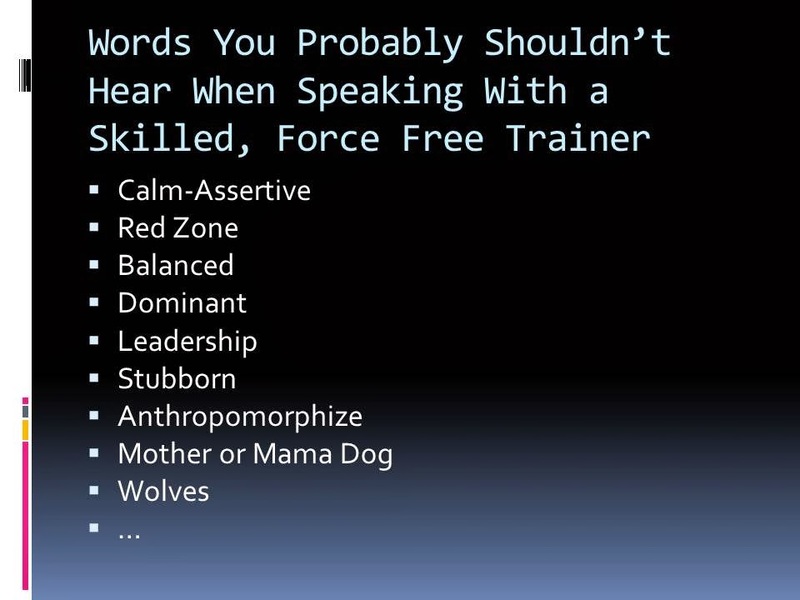 I’m not saying you should never hire a trainer who uses the below words, but hearing the words is cause for a deeper investigation into the trainer’s experience level. Any term that labels the dog instead of describing behaviors i.e. “this dog is weird” or neurotic, or crazy, etc..
-When discussing choke chains, shock collars, prong collars, etc..
Talking in the extremes or in black and white or "either or"
"There is more than one way to train a dog"
As a pet parent who lives with 4 dogs who all have different personalities, I can say with certainty that this a true statement. But when Puddin and I hear or see this terminology, it is often from someone who is criticizing force-free, positive reinforcement based training... someone who feels that other methods should be used or considered – methods like pain, fear, startle and intimidation. There are several positive ways to train and several negative ways to train. Our dogs would be a lot happier if we found the right positive way that works for them. "Force the dog to face his/her fears." This can often backfire and make a dog much worse. We should introduce dogs to scary things gradually. Desensitization and counter conditioning is the way to go. Dogs do need exercise for their physical and mental well-being. And exercise can curb certain behavior issues (like destructiveness, hyperactivity, etc..). But for dogs who have serious behavioral issues – like “aggression,” we have to be careful when we encounter trainers who consider exercise as a cure or fix. If pet parents hand their dog over to a trainer who takes fluffy for a 5 mile run in the summer, she might be too exhausted to charge or attack a human or other dog right after the run. But what happens in real life when the dog can’t get that type of exercise several times a day? Or what happens with dogs who aren’t physically able to exercise that hard? Exercise should be used in conjunction with things like desensitization and counter conditioning, creating a calm environment, management etc.. The are probably some really good trainers who are self-taught so I'm not saying rule these people out completely. But a trainer who might have taught him or self the wrong way can cause irreparable damage to our beloved pets (mentally and physically). If someone says he or she is self taught, insure that part of their personal education includes learning theory. Ask questions. "I've been around dogs all my life.."
Nothing wrong with this term per say. But pet parents need to make sure that the "trainer" didn't get his or her education from watching television. Are also terms that might alert us to the fact that the trainer intends to copy things he or she has seen on an edited television program. Yes, this sounds like it's a good word. And it is. But I often hear it used by trainer who say that the dog must learn to "trust" them while they are forcing the dog into scary situations. Which makes a dog NOT trust the handler.